As you read this, a perfect storm is brewing. Each year the Wyakin Warrior Foundation hosts a Guardian Ball (“Wyakin” is a Native American term meaning “Guardian Spirit”) to raise funds to help more wounded and injured veterans get through school and into careers. The gala brings three groups together in the same room, and it is electric. Legends of the cartooning world are there, including Tom Richmond (MAD Magazine), Jeff Keane (The Family Circus), Marcus Hamilton (Dennis the Menace), Rick Kirkman (Baby Blues), Mason Mastroianni (B.C. ), Glenn McCoy (The Flying McCoys), Steve Moore (In the Bleachers), Todd Clark (Lola), Bill Amend (Fox Trot), and Jeff Myers (former illustrator and director of The Simpsons). 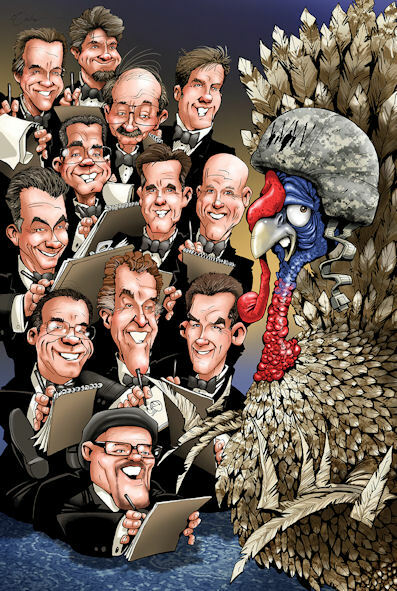 The honored artist this year is Paul Combs, firefighter and author of Drawn By Fire. Twenty three of them, plus a few who have applied for next year’s class. All are severely wounded or injured veterans who are overcoming their physical challenges to eventually achieve great things in life. From politicians to celebrities to war heroes to philanthropists, the community gathers to embrace the veterans who have sacrificed for their country. I wish you could see it. More to the point, I wish you could feel the benevolence that lives in the big ballroom as the crowd of over 600 shows its support. The evening is actually more than a fundraiser; it is an opportunity for the warriors to get experience in a formal social setting. One day, when they find themselves entertaining or attending company functions, they will feel comfortable because they have been there before. It is a perfect storm of good feelings, and a perfect way to kick off the holiday season.